USDA certified organic veggie burger. Only organic whole food ingredients are used, such as raw ground sunflower kernels, brown rice, fresh carrots, herbs and sea salt, all of which (the company is proud to say) consumers can pronounce. Yay! They went on to share that Organic Sunshine Burgers come in several flavors: Garden Herb, Barbecue, South West, Breakfast and Falafel. 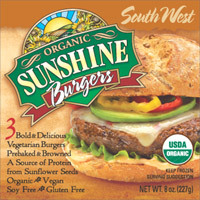 All Sunshine Burgers are fully cooked and browned in the oven and come frozen to preserve freshness. Sound easy to me! You can find these burgers at Whole Foods as well as in many other health food stores and co-ops across the country. They have been busy getting their products out for us consumers. Casein Free and Palm Shortening! Sounds great–have you tasted them yet? The Sunshine burgers are my absolute favorite!!! I’m a vegetarian, not eating a gluten-free diet, but heard you interviewed on a podcast and then visited your website. These burgers, especially the Southwest ones, are phenomenal!